Hubert E. Stassen is a consultant with Stassen Consultants, Enschede, the Netherlands. Humans have produced and used charcoal as fuel for cooking and grilling since the Stone Age, and for producing metal implements since the Bronze Age. In developing countries charcoal is still widely used by urban and rural people as a smokeless domestic cooking and grilling fuel with a high heating value. In developed countries there is an increasing demand for charcoal as a barbecue fuel. Large amounts of charcoal are used in copper and zinc production as well as in the production of precious metals. Heating wood in the absence of air results in the production of charcoal, volatile tars and a mixture of gases. The relative amounts of these three types of products depend on the equipment used and on the characteristics of the original wood. The moisture content is an especially important parameter. Dry wood produces more charcoal then wet wood. In domestic or barbecue applications the remaining tar (or volatile) content of the charcoal is important. The higher the fixed carbon content, the lesser the tar and the lesser the smoke during combustion. For metallurgical applications the ash content and the size and crushing strength of the charcoal are also of importance. Until the beginning of the twentieth century virtually all charcoal was produced by traditional methods. Wood was put in dug-out earth pits, lit and covered with earth. The combustion of part of the wood produced enough heat to carbonize the remainder. Alternatively, heaps of wood were covered with earth and sod and lit through openings in the earth cover (earth kilns). Those openings could be judiciously opened and closed and new ones could be made to control the introduction of air. This method allowed somewhat more control over combustion and carbonization than the pit method. Both techniques persist to this day in many developing countries, mainly because they are cheap. However, they often produce very low yields (typically 1 kg of charcoal from 8 to 12 kg or more of wood), inconsistent quality (because it is difficult to maintain uniform carbonization) and environmental pollution from the release of tars and poisonous gases. 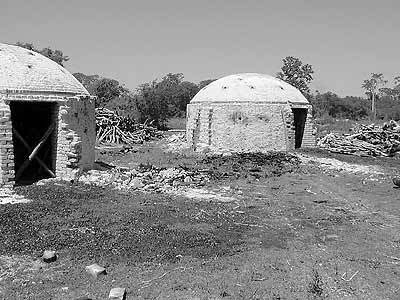 In the 1970s and 1980s, efforts were made to improve traditional charcoal making by equipping earth kilns with chimneys made from oil drums (Casamance kilns) and by introducing small-scale steel or brick kilns. These methods all rely on partial combustion of the wood charge to provide the heat necessary for carbonization; therefore yields depend heavily on the moisture content of the wood. With good practice, yields of 1 kg of charcoal from 4 to 5 kg of air-dried wood are possible. Yields of 1 kg of charcoal from 6 to 8 kg of wood are more common. The advantage of processes using a solid cover (metal, brick or concrete) stems from the hermetic seal such a cover provides, which minimizes the effect of poor supervision and gives more consistent results. Steel and brick kilns are less labour intensive than (improved) earth mounds. However, they may be less accessible to small-scale traditional charcoal makers because of their higher costs. Improved traditional small-scale methods should be encouraged in most cases. 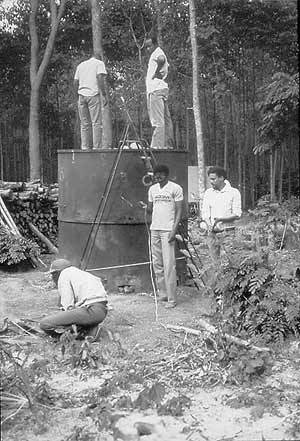 The industrial demand for charcoal in the twentieth century elicited new larger-scale technologies mainly aimed at improving yield and quality. 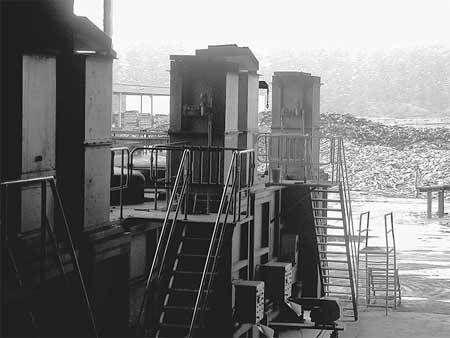 Different types of batch-wise operated brick or metal kilns or continuously operated retorts were designed, which considerably increased yields (typically 1 kg of charcoal from 5 to 7 kg of wood) and produced a much more uniform charcoal product with a higher fixed carbon content. Many factories of this type are still in operation today in Europe as well as in North and South America. However there is a persistent problem with pollution. Charcoal factories emit large amounts of smoke, soot and tarry particles and a foul odour, and they are considered a menace to health. The current trend in charcoal production aims at improving the environmental perfor­mance of equipment while maintaining and/or improving charcoal yield and quality. Steel vessels or retorts are filled with pre-dried wood and placed in a ceramic brick-lined carbonization furnace heated to 900°C. The tars and gases produced as the wood heats up are led to a separate high-temperature combustion chamber. The flue gas from this combustion chamber is used to heat the carbonization furnace, and the remaining heat from the furnace is used to pre-dry the wood. The very good heat management of this type of equipment makes it possible to produce 1 kg of charcoal from 3 to 4 kg of wood. Because of the very high temperature of the combustion chamber, all particles, tars and gases are completely combusted. In the Netherlands, equipment of this type has been certified to meet strict emission standards for combustion installations. Emissions of tars, carbon monoxide and nitrogen oxide as well as smell components are well within the legal limits. The new high-yield, low-emission charcoal factories have higher investment costs than the old-fashioned brick or steel kilns or retorts. However, in many cases the improved yield more than compensates for the higher investment, so the improved emissions come as a no-cost bonus. As a result, this relatively new technology has spread in the past two years, not only in the environment-conscious countries of the European Union (France, the Netherlands), but also in Eastern Europe (Estonia) and in developing regions (China, Ghana, South Africa). A carbonization factory for the production of charcoal from municipal waste wood is under construction in Singapore.